Beautiful Easter shoot by Green Wedding Shoes. I like papier-mâché and used to have a collection of Easter egg boxes. I've no idea how or why I began to collect them, like so many things I have, they just happened. And then they just disappeared, probably during one of many moves in either a pre clear out, or a mislaid box. I used to give and receive them filled with chocolates, and tied with a ribbon. I don't miss them, but I wish I would have owned a camera and photographed them, and I hope that wherever that they are, they found a good home. Papier-mâché boxes and eggs always remind me of both Easter and Alice in Wonderland. Our cottage is adorned with several Alice vignettes. One of my Grandmothers was named Alice and I was given the name as one of mine too, after her. Although the Easter egg boxes are gone, I have a small collection of hand painted papier-mâché boxes from Kashmir in which I keep pieces of jewellery on my dressing table. an exquisite pattern of mille fleurs. I keep another collection in it - Miracle jewellery. fairy tale cottages in Carmel by the Sea, 20 years ago. I love the cat shaped box, adorned with bright flowers. As March ends you would expect Spring to be in full bloom, but it is not so here. I have seen no Deer in the woods, and few Hares, being mad or not. We have had very high winds (we do live on a hill) and rain with hail. 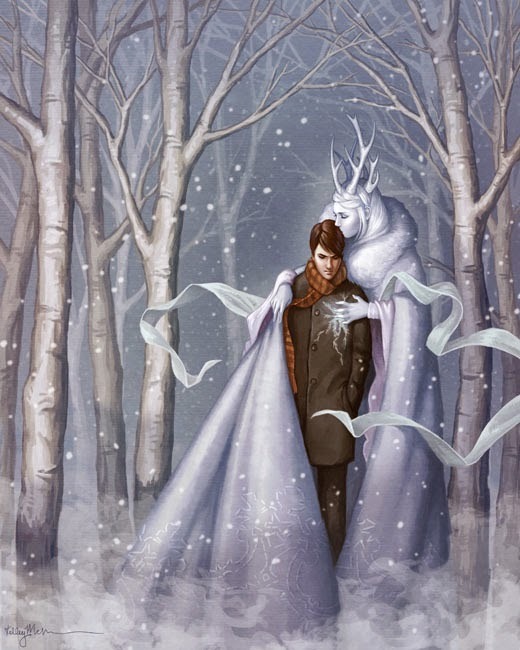 It is a bitter biting wind as if the Snow Queen has grabbed hold of you with icy fingers and a sharp nail has pierced your skin. This weekend is a Bank Holiday in England. The church school behind our cottage is very quiet without the children, and the cats have been playing in the wild woods of the church amongst the daffodils and primroses. This time of year I like to wander in the gardens of English Country houses and ruined abbeys where you feel as if you may at any moment come upon a Mad Tea Party or you could have your own. Alas, I think that the Easter Bunny may even need to don a long tweed coat and a rain hat prior to bringing children their treats. 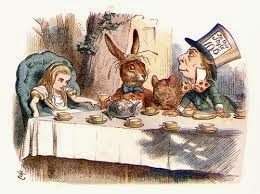 The Mad Tea Party Alice illustration by John Tenniel. The March Hare is wearing straw in his ears, a sign of madness! Even in this weather, and whatever that we believe, this is a time for rejoicing in the life that is beginning all around us, and giving thanks for each day we are here to see it. I think I will wrap up warm and venture out to see if I can find some March Hares and then curl up by the fire with a book and the cats. Oh, and chocolate. That diet will just have to wait for a few more weeks until the sun comes back. I love this painting, but do not know who created it. Please leave me a comment if you do! Oh Leanne, your header is SO MAGNIFICENT! As we have been having unusually warmer weather (we are in the midwest of the USA), today is windy, a little cooler, and your cottage life sounds snug and cozy to me! Our cottage is sweet and I just finished my décor today. I am happy with my Peter Rabbit theme! Such a beautifully illustrated post! Reading this was like a tiny holiday from the driving snow here in the prairies, where we are for EASTER. We're missing the blossoms of home but the four little grandchildren make up for it. I have a collection of paper mâché eggs, collected decades ago when we first lived in Europe. I love to take them out and arrange them in various bowls. I love that rabbit head. It's really whimsical! I'm glad it's warm here in Texas and I hope the warmth will reach you soon. I'm looking at your sidebar and I'm a new black cat owner. I just got my little Gigie in February. Glad to be part of the fan club! :) Happy Easter! That's something missing in my cat collection a paper maché cat ! I wished I could also go outside and walk around a little bit, but spring is on strike and Brussels sits in the rain ! Lovely tea party, with them enjoying it. Papier mâché is such a curious material. One would think that it would be quite fragile but, in reality, it is robust and strong. We have a papier-mâché table which we inherited and, together with its complementary chair, it always attracts attention and disbelief in equal measure. It us difficult to think of something so decorative yet practical being made essentially from paper. Such a pity that you can no longer trace your papier mâché Easter eggs. We can well imagine them being beautiful containers for smaller eggs or chocolates. The perfect Eastertide gift. But, your boxes from Kashmir are delightful and beautifully decorated. 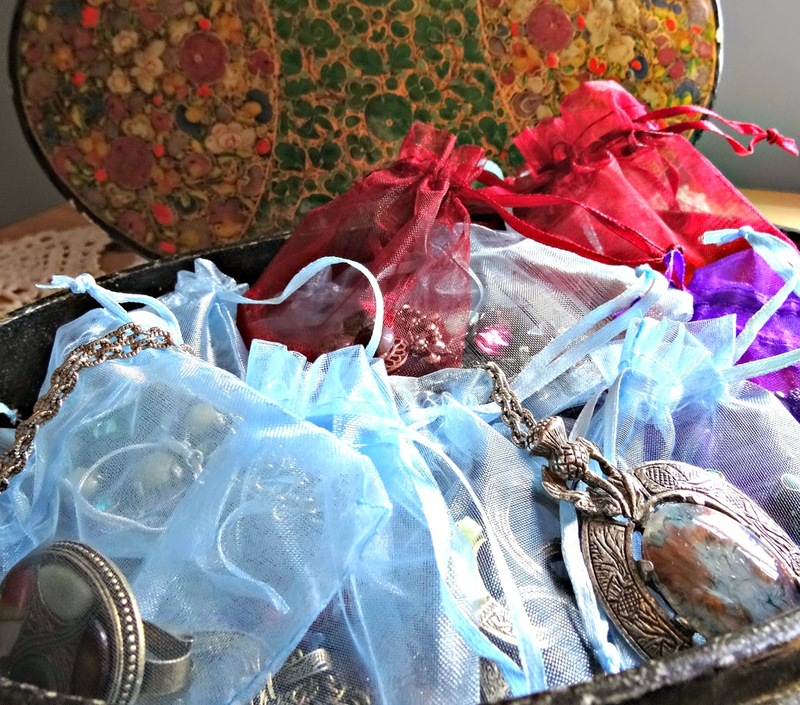 Perfect for storing your tiny treasures. Such lovely work! You are more patient than I would be. 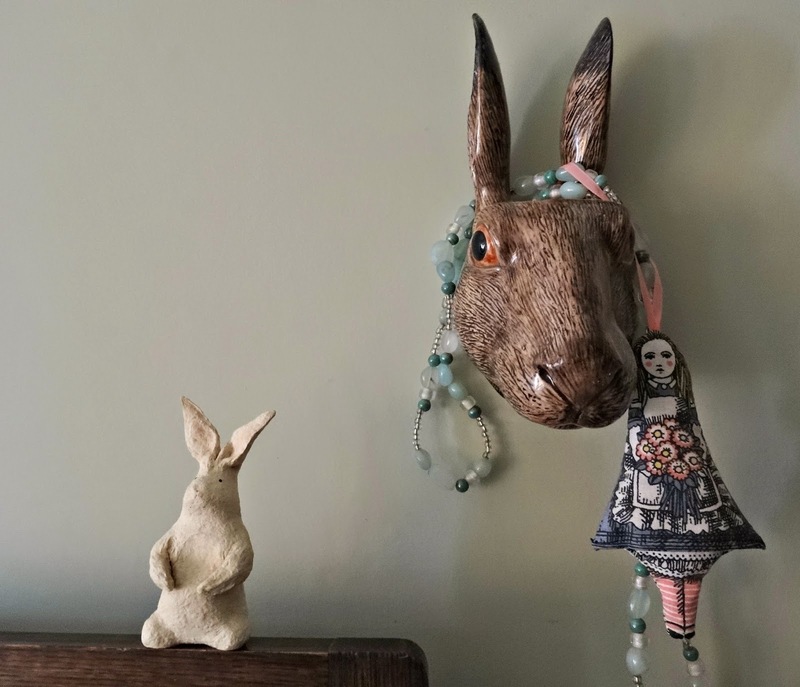 Such a lovely post and how wonderful the paper mâché eggs and March Hare are - I too love Alice in Wonderland. Also adore your gorgeous header - the cottage with Mrs Black and cat are so cute. I just saw you enjoy Narnia, we watched the movie last night. 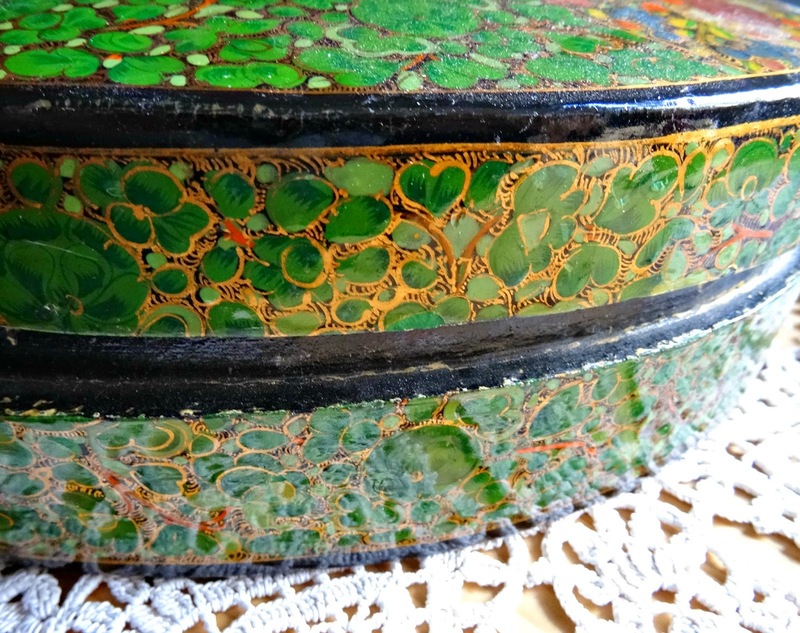 Lovely post and quite surprising to read that you too have papier mâché boxes from Kashmir. My husband has been there and I have imported for a couple of years, before the trouble of all those killings..., for my business. Oh, how often I wish we had good cameras back than for capturing certain beautiful pieces but we can only vaguely remember them. I bet you did have a beautiful collection of Easter Eggs and those I do love very much. There is so much import from China but it lacks the charm that we remember from years past. Lovely reading and I'm wishing you and yours a very Happy Easter! 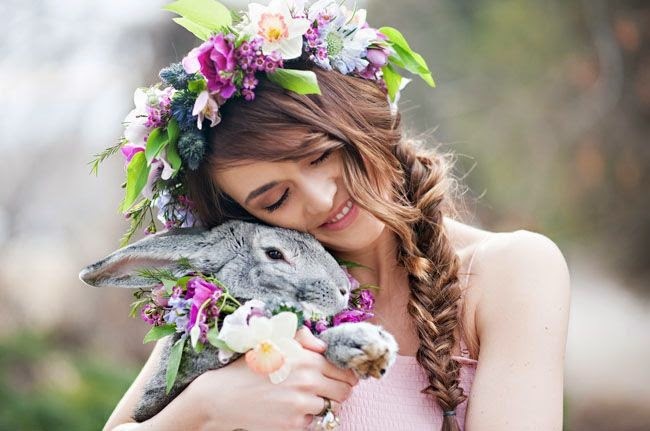 What a beautiul Easter wedding shoot! Such sparkling colours and sweet looking rabbit. Love your new header. It suits your blog! 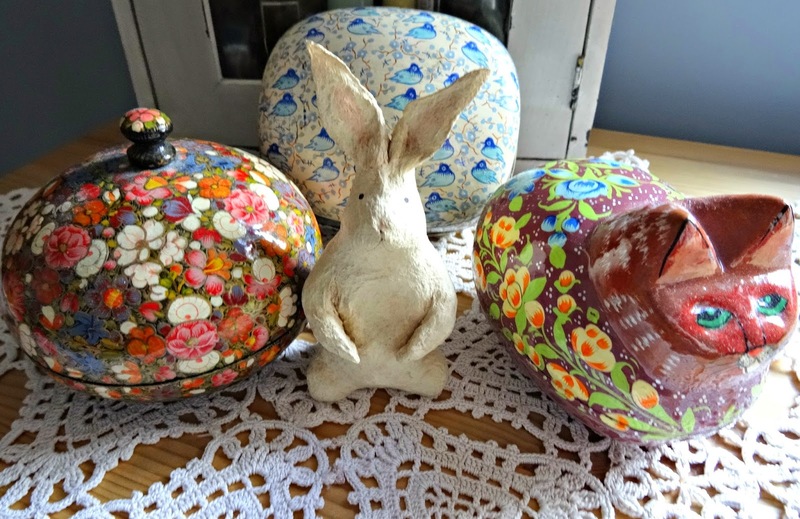 Paper mache boxes, very pretty and bunnies too - I don't usually have ornaments but would make an exception for your lucky white rabbit. I think your header is magical, perfect for your blog. So many beautiful things! Thank you for sharing! Everything on this post is sweet and spring-y and gorgeous! Fabulous collection of Bunnies, thanks LeeAnn. 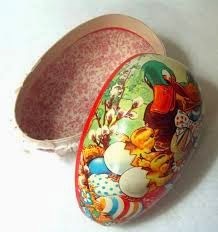 I have one of those papier mache eggs - I wonder if you can still buy them. I think it was given to me years ago. Leeanne, this is so strange; your post just came up on my blogroll today, April 29....but this is from April 1! I wonder why I'm just barely getting it! Delightful, however! I hope you are having a grand April and now we're ready for MAY!!! 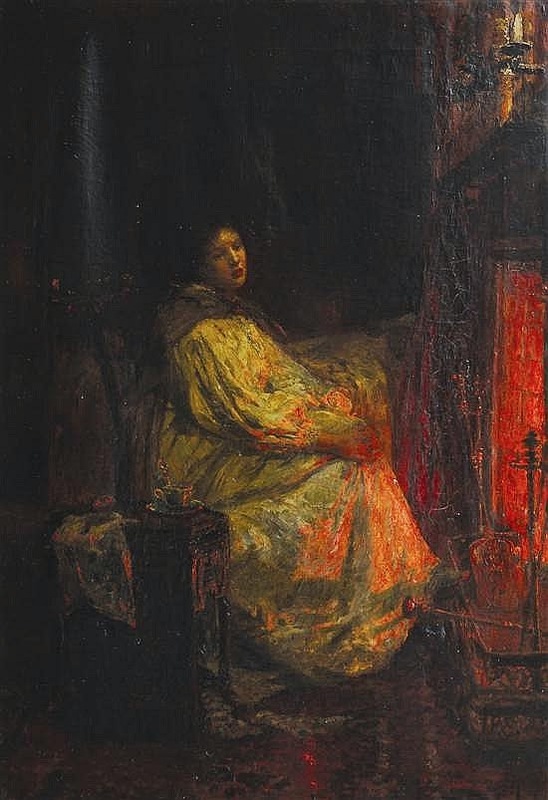 The painting is by Lionel Percy Smythe.